I received this book from my secret Santa in 2017 and have finally gotten around to reading it. 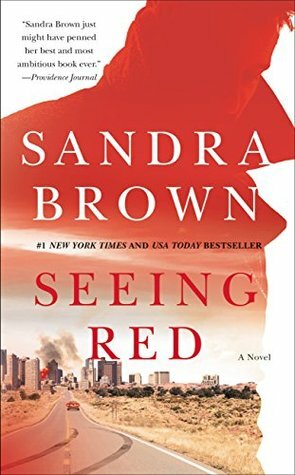 Sandra Brown had always been one of my all-time favourite authors, so I had high expectations for Seeing Red. She did not disappoint. Ms. Brown took me on a ride filled with suspense, mystery and has jaw dropping twists, served with a side of romance. This is a story that will keep you up through the wee hours of the night as you need to know how it will all end. John Trapper and Kerra Bailey are the focus of this fantastic story. Kerra, top-notch journalist is on the verge of boosting her career if she lands an interview with town hero Major Franklin Trapper. Numerous attempts to secure the interview proved futile. so armed with the reluctant assistance of the major’s son along with an important piece of information from an incident which occurred twenty-five years ago Kerra set out to secure the interview. However, her attempts to gain the interview set into motion events that place her life and that of the major in jeopardy. John Trapper has been living in the shadow of his father’s heroism for the past twenty-five years. He believes there is more to the incident than they led people to believe. His determination to prove his theory led to his personal and professional life spiralling out of control. This did not stop him from continuing his investigation if anything it spurred him to further to try to prove to all he was not delusional. I loved both Kerra and John. Initially, I had a difficult time warming up to John, but as I peeled away his layers and delved deeper into what made him tick, I found myself drawn to him. Yeah, he was rough around the edges but he cared and determined to protect those he loved. I admired Kerra’s professionalism and ethics. She never allowed her desire for a story to take precedence over what she considered being the morally correct thing to do. Kerra and John together was a forced to be reckoned with both professionally and intimately. I thought they worked well together in their pursuit of the truth. When I stated earlier that Ms. Brown took me on a suspenseful side, it was no exaggeration. From the start to the end. Figuring out what was going on was no easy task. Then there were the jaw dropping twists that the author revealed near to the end. I never saw that last one coming. That was the doozy of them all. That reveal was devastating for quite a few persons. Fans of Sandra Brown will love Seeing Red. If you love romantic suspense, but read none of Ms. Brown’s work this would be a good place to start.